English: Electricity consumption in Jordan has risen by 50 percent between 2004 and 2009 (GIZ 2013). This rapid growth is in part due to increasing living standards as well as high energy subsidies that cause price distortion. The government aims to reduce these subsidies and promote energy efficiency and renewable energies. In this context, electricity tariffs are expected to rise significantly in the long term. Air conditioning contributes significantly to electricity demand and its use is expected to increase along with economic growth and rising global temperatures. Solar cooling absorption technologies can use up to 75 percent less electricity than conventional compression chillers. Further environmental and climate benefits also result from the use of natural refrigerants (e.g. lithium bromide in the case of an absorption chiller), virtually eliminating direct greenhouse gas emissions from leakages of refrigerants with high global warming potential. At present, solar thermal energy is mainly used to heat water in buildings. High solar radiation in Jordan makes solar cooling also very suitable for local conditions. 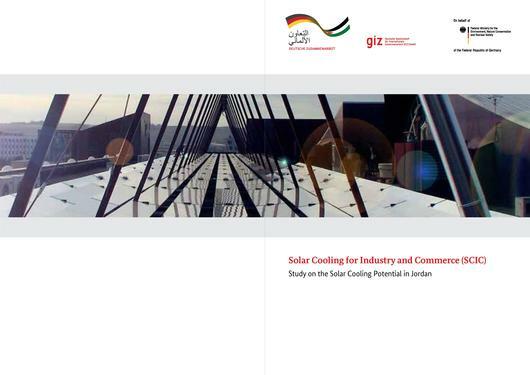 The study “Solar Cooling for Industry and Commerce – Study on the Solar Cooling Potential in Jordan” explores the market potential of solar cooling in Jordan given two scenarios: (1) moderate increase in technology and (2) high market penetration under high energy prices and accelerated phase out of fluorinated gases. The study was developed while establishing four pilot demonstration projects on solar cooling absorption chillers with solar thermal energy supply in different regions in Jordan. The study elaborates on strategies to overcome existing market barriers for solar cooling, namely, the high upfront investment costs (due to lack in economies of scale), the lack of local technology suppliers and specialized technicians, and the lack of awareness among policy makers and end users. The study concludes by discussing different technologies and policy options. This page was last modified on 13 April 2016, at 15:17.